The present study aimed to investigate the embryotoxicity of endosulfan (ES) on marine medaka Oryzias javanicus embryos using several toxicity endpoints such as measurements of oxidative stress, DNA damage, cell death, and AChE enzyme activity upon different concentrations of waterborne ES. Fertilized marine medaka embryos (3 hpf) were exposed to three concentrations of ES (86.2, 172.4, and 862 µg L−1). Oxidative stress parameters [e.g. intracellular reactive oxygen species (ROS), malondialdehyde (MDA), and glutathione (GSH)], nitric oxide (NO) production, DNA damage, cell death, and acetylcholinesterase (AChE) activity were analyzed. The highest concentration 862 µg L−1 of ES significantly increased the intracellular ROS, MDA, GSH, and NO in the embryos compared to control groups. Endosulfan increased DNA damage and cell death in the marine medaka embryos during post fertilization period. In the case of AChE, a significant inhibition was detected in the 862 µg L−1 ES-treated medaka embryo. In addition, intracellular GSH level was increased by 172.2 µg L−1 ES exposure in medaka embryos. Our results suggest that ES may induce strong cell death through increase of oxidative stress and DNA damage. Inhibition of AChE would represent potential neurotoxicity on cholinergic system of marine medaka embryos. The parameters tested in this study would be a useful biomarker for risk assessment of ES as an early signal of its toxicity. 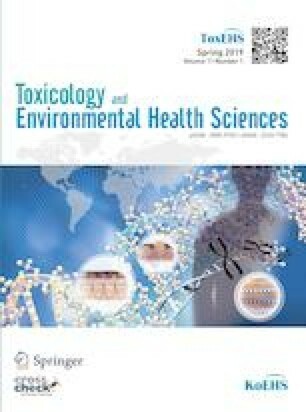 Publication of this article was co-sponsored by the ToxEHS.